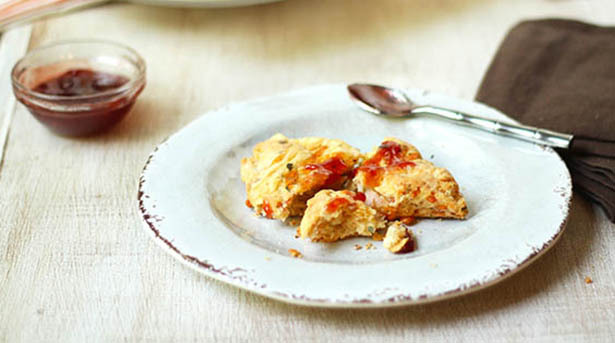 Add a savory touch to the classic scone and you’ve got a perfect grab-and-go breakfast, or cut smaller to serve at a luncheon. Hot pepper jelly or your favorite preserves compliment the cheese and herb combination nicely. Preheat oven to 400˚. Line a large baking sheet with parchment paper; set aside. In a large bowl combine flour and next four ingredients until well mixed. Cut butter into small cubes then quickly work it into the mixture (using your fingers or a pastry cutter) until it resembles a coarse meal. Add buttermilk, cheese, ham, scallions and parsley. Gently mix together with a fork until everything is just moistened. Don’t over mix. Turn dough out onto a clean, floured work surface and shape into an 8-inch circle, about 1-inch thick. Cut dough into 8 wedges and carefully transfer to prepared sheet. Bake 20-25 minutes or until tops are lightly golden brown. Brush with a little melted butter and serve with pepper jelly or preserves if desired. Note: For smaller portions, you can cut into 3-inch circles using a biscuit cutter, but cooking time needs to be reduced to 16-20 minutes.